With some bike manufacturers trying to get you to buy online and literally just pick them up from their local stockist, other bike suppliers are trying to merge and create unassailable price­points. 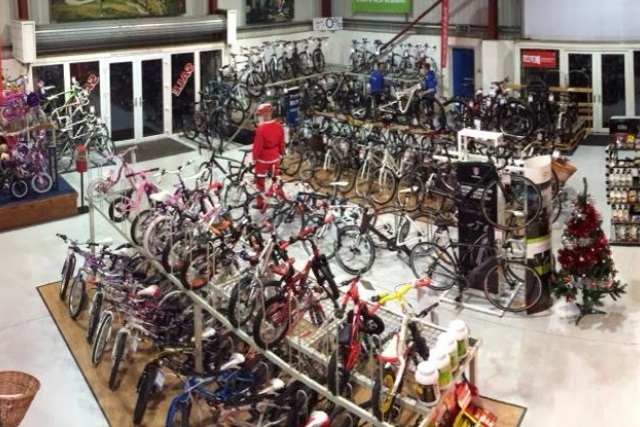 Is the writing on the wall for local bike shops? Er...no. Whether you are a casual rider, professional or fitness fanatic, or a parent buying a bike for your kids, why should you go anywhere else than a major chain store, and just pick something off the shelf? Passion for bikes of all types, no matter what the personal preference of the staff member concerned. Real personal service where there is plenty of staff always available, who recommend not on the basis of personal targets, but asking questions to determine exactly what is right for you. Being able to try out any bike, and ensuring youur knowledge expands each time you visit. Price Matching. ­ Small retailers live and die on the basis of loyalty, and you will never need to shop anywhere else. With branches in Bridgwater, Weston Super Mare and Taunton, they have each part of the south­west well locked down. Positioned between Exmoor, The Quantocks and the Mendips with this area often being a junction to Wales this is very much an area strong with bike communities. Having attended two of the branches, and bought a number of accessories from the Bicycle chain before, the story how I came to acquire my latest mountainbike is a story of aptitude, passion and confidence in their products and their knowledge. After being confidently inspired on the local knowledge of a local Enduro racer who works in the Taunton branch, I inspected one of their better Enduro bikes, all the time while my son explored the surrounding bike tyres... calling out bike...bike.. bike.. he was entertained, I was informed and I know at least I will have someone to hunt down and chase around a section one of these days.... if I can catch him. Later, after getting a bike shipped from Taunton to Bridgwater to test on their test track and obstacles they went the extra mile to give me that service. Key here was the expert guidance on shocks, riding position, and careful questioning to be sure that I had considered bikes of different geometry's and makes depending on the type of riding I was going to do. The staff in the shops didn't care about how much money I spent, only that I had what I needed. Finally after ordering via email and phone which the staff kept up great communication throughout, they answered many queries and questions consistently and fast. Above all they spotted a tiny issue with the rim­strip­ in ­place already tubeless ready rims, one I never would have spotted, and replacing a wheel under warranty saving me a lot of inconvenience and potentially a hazardous and ride­ interrupting issues in future. On delivery, they expertly setup the configuration of the bike, and analysed my riding style to make tiny tweaks to the bike. Absolutely the icing on the cake. Stay tuned next time for how they did with our next project... converting an aged damaged mountainbike to a country path cruiser for kid­carrying for when i'm not pushing the limits of this newly acquired steed from Trek.